The operator can insert all his administrative references (name, address…) as well his logo (b&w or colour). 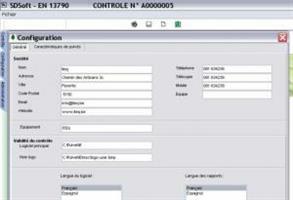 His references will be shown in the windows of the software and will be printed on the inspection report. The report is personalised for each operator. This configuration can be done very easily and quickly with the user-friendly software. The software can also be adapted to specific requirements (local, regional, national rules), on the basis of an estimate. No reviews were found for Setup of Administrative Software. Be the first to review!